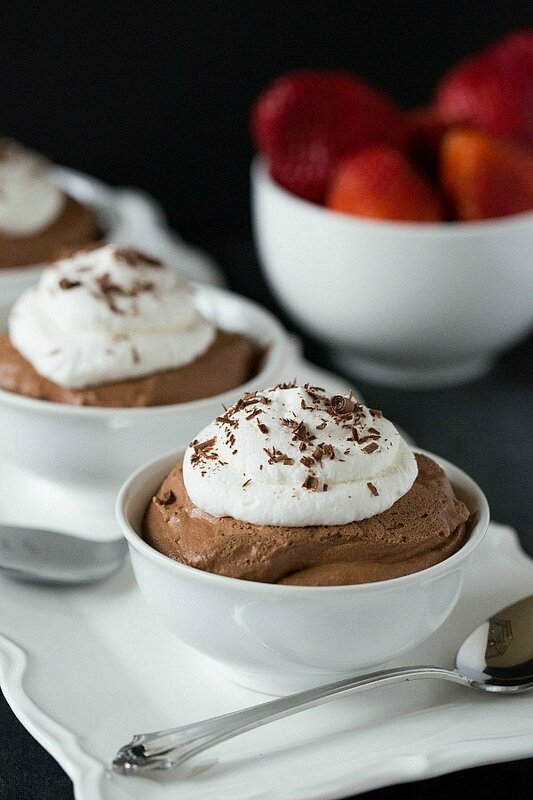 When I was a kid, chocolate mousse seemed like one of the fanciest desserts I could imagine. Weeknight desserts usually consisted of Jell-O with Cool Whip, and aside from that, there were sometimes cookies or Entenmann’s goodies at my grandma’s, and the occasional cake at a birthday party. I can only remember a couple of instances during my childhood that mousse was placed in front of me. It always stood out as something special. Served in a fancy glass goblet, topped with whipped cream and a garnishment… that was something to behold! It was chocolate, therefore I loved it, but it wasn’t until much, much later that I was really able to appreciate a wonderful mousse dessert. While I placed chocolate mousse on my 100 list years ago, I just recently got around to making it. As is always the case when it comes to great recipes… better late than never. Part of the reason it took me so long to make homemade mousse is that I could never settle on a recipe. I wanted something that would be smooth, light and almost foam-like. I didn’t want merely a lightened-up version of pudding, but something much more spectacular. 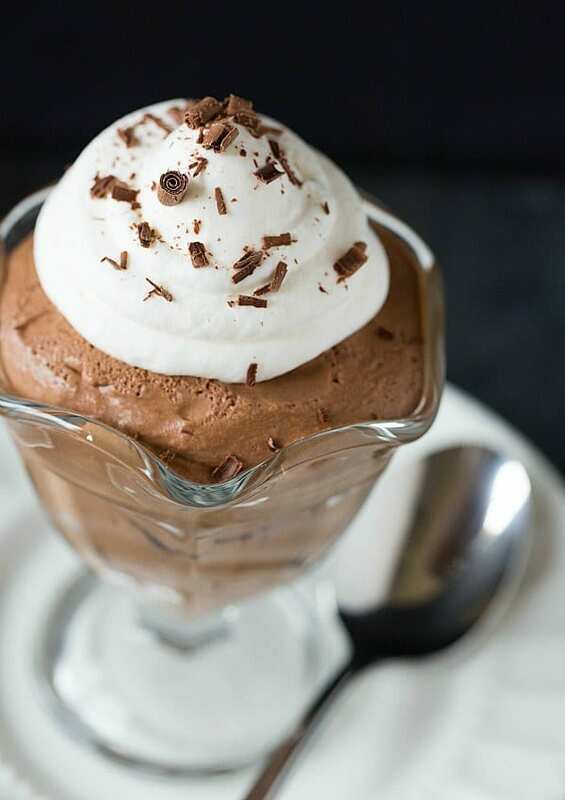 Surprisingly, hardly any of my tried-and-true cookbooks contained a recipe for chocolate mousse, but one of my newest favorites – The Science of Good Cooking – had a version that sounded like it fit the bill perfectly. In less than 30 minutes, I had the mousse made and it was in the refrigerator chilling. 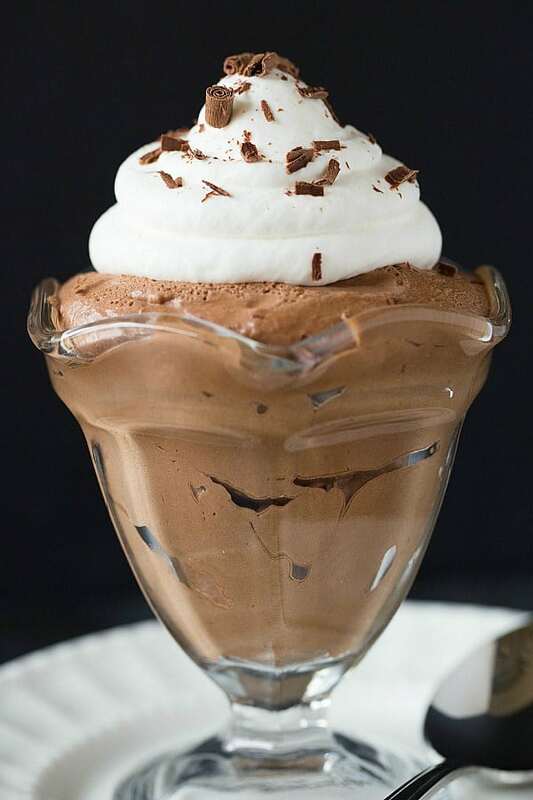 Once chilled and set, the mousse was everything I had hoped it would be… bursting with a clean chocolate flavor, a light, melt-in-your-mouth texture and silky smooth. 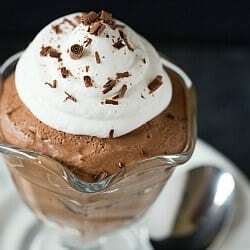 I topped the mousse with fresh whipped cream and chocolate shavings; it would also be wonderful with some fresh berries on top. This is a perfect dessert to serve to company since it can be prepared in advance easily and served in individual glasses or dishes. It doesn’t take a lot of time, fancy equipment or hard-to-find ingredients to make something that’s extra-special… especially when you make it with love. This fabulous mousse recipe is a testament to that, and it’s one that I’m going to tuck away as a “tried-and-true” for decades to come. 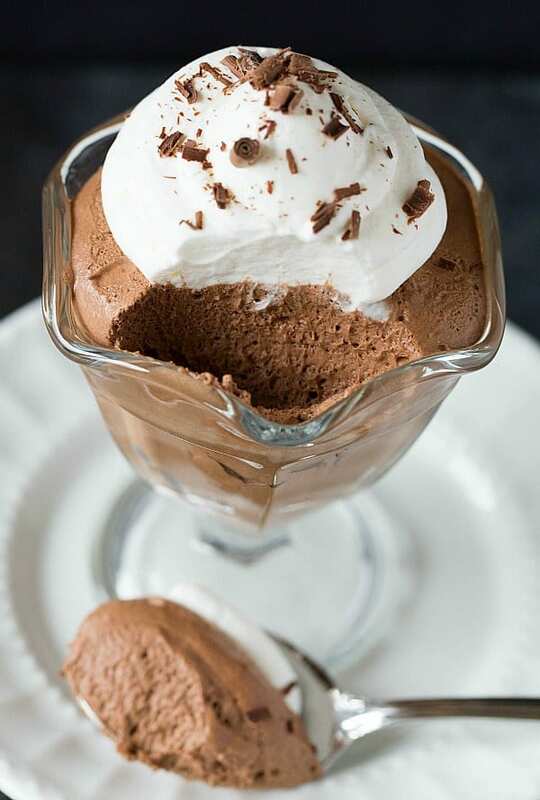 A fabulous recipe for classic chocolate mousse. Combine the chocolate, water, cocoa powder, brandy and espresso powder in a medium bowl. Place the bowl over a small saucepan filled with about 1 inch of water set over low heat, so that it is barely simmering. Stir the mixture frequently until it is completely melted and smooth; remove the bowl from the heat. In a large bowl, whisk together the egg yolks, 1½ teaspoons of the sugar and the salt until it is slightly thickened and pale in color, about 30 seconds. Pour the melted chocolate mixture into the egg mixture and whisk to combine. Let cool until it's slightly warmer than room temperature, about 5 minutes. Whip the egg whites using a stand mixer with a whisk attachment on medium speed until foamy, about 1 minute. Add the remaining 1½ teaspoons of sugar and increase the speed to medium-high. Continue to whip until soft peaks form, about 1 more minute. Gently whisk one-quarter of the whipped egg whites into the chocolate mixture. Add the remaining egg whites and gently fold into the chocolate mixture using a rubber spatula until just a few white streaks remain. Wipe out the mixing bowl and then add the heavy cream to the bowl. Again using the whisk attachment, whip the cream on medium speed until it begins to thicken, about 30 seconds. Increase the speed to high and whip until soft peaks form, at least another 15 seconds. Using a rubber spatula, gently fold the whipped cream into the mousse until no white streaks remain. Spoon the mousse into individual serving cups, cover with plastic wrap and refrigerate until set and firm, at least 2 hours or up to 24 hours. If you are concerned about using raw eggs in this recipe, look for pasteurized eggs - almost all grocery stores carry them now. You can omit the brandy if you do not drink alcohol. You may substitute vanilla extract, adding it to the egg yolks, sugar and salt in step #2.